The word “conversion” will be used to imply conversion of surgical technique from OPCAB to CPB to facilitate completion of CABG surgery. We hypothesized that the outcome of patients who underwent conversion was poor in contrast to patients who underwent successful OPCAB. This study was carried out between January 2013 and December 2016. Institutional review board approval was obtained, and the need for patient consent was waived in view of retrospective nature of the study. Patients scheduled to undergo elective OPCAB, requiring conversion were studied. Approximately, two consecutive OPCAB cases (without conversion) after each conversion were taken as “controls” for comparison. Patients who underwent elective surgery under CPB were excluded. Patients receiving two or more inotropes preoperatively, hemodynamically unstable (low mean arterial pressure, elevated pulmonary artery wedge pressure, signs of hypoperfusion such as low mixed venous oxygen saturation and elevated serum lactate level) with/without intra-aortic Balloon pump (IABP) or ventilation, requiring additional procedure such as valve replacement or repair in addition to CABG and coronary artery coronary endarterectomy were electively subjected to CABG under CPB. Indications for conversion were one or more of the following: inability to carry on with OPCAB due to acute hemodynamic disturbance not responding to conventional inotropic medications, or severe arrhythmias, or excessive uncontrollable bleeding from the anastomotic site or inability to carry on with CABG by the surgeon due to technical difficulty. Before induction of general anesthesia, femoral arterial catheter and Swan Ganz catheter were inserted. Pulse oximetry, end-tidal carbon dioxide, intermittent arterial blood gases and electrolytes, blood loss, urine output, rectal and esophageal temperature were measured additionally. Transesophageal echocardiography probe was inserted after intubation of trachea. All patients were administered a standardized technique of general endotracheal anesthesia and were mechanically ventilated. Left internal mammary artery was harvested following midsternotomy; based on requirement, either saphenous vein or left radial artery or right internal mammary artery was additionally harvested. Activated clotting time of about 240 s was achieved by administering 200 mg/kg intravenous bolus of heparin. Proximal anastomoses of the vein grafts were carried out using aortic side clamp before conducting distal anastomoses. The left internal mammary artery was most often anastomosed to left anterior descending artery first, and subsequently, the other grafts were performed. After completion of grafting, residual heparin was neutralized using protamine. The patients were transferred to intensive care unit for further care. The inotrope of first choice was intravenous infusion of noradrenaline (0.025–0.1 mic/kg/min). If the response was inadequate, intravenous adrenaline (0.025–0.1 mic/kg/min) infusion was added. Other agents such as milrinone, vasopressin, and dopamine were used based on the hemodynamic parameters such as cardiac index, central venous pressure, pulmonary artery wedge pressure, mean arterial pressure, systemic vascular resistance, and mixed venous oxygen saturation. IABP counter pulsation: As per the hospital protocol, patients with elevated pulmonary capillary wedge pressure, poor left ventricular function, ongoing angina, and pulmonary edema would receive preoperative intra-aortic balloon pumping. ST segment changes, regional wall motion abnormalities, evidence of congestive heart failure, and inability to support hemodynamic parameters were considered indications for intraoperative IABP. The incidences of conversion and inhospital mortality (defined as any cause mortality in the same hospital admission) were described. Odds ratio for mortality in conversion was estimated from this cohort using a logistic regression model. Factors associated with/predicting conversion were analyzed. Analysis was performed using the statistical package “R for Statistics” 3.3.1 (Vienna, Austria). The values were shown as mean ± standard deviation. During the period of January 2013 to December 2016, a total of 3239 cases of CABG were conducted at our facility, of which 2857 underwent using OPCAB technique. Ninety patients (3.1%) required conversion to CPB. One hundred and sixty-two patients were chosen as controls. During this period, 382 patients (excluding the CPB due to conversion) underwent CABG surgery electively under CPB. The reasons for conducting them under CPB are mentioned in [Table 1]. 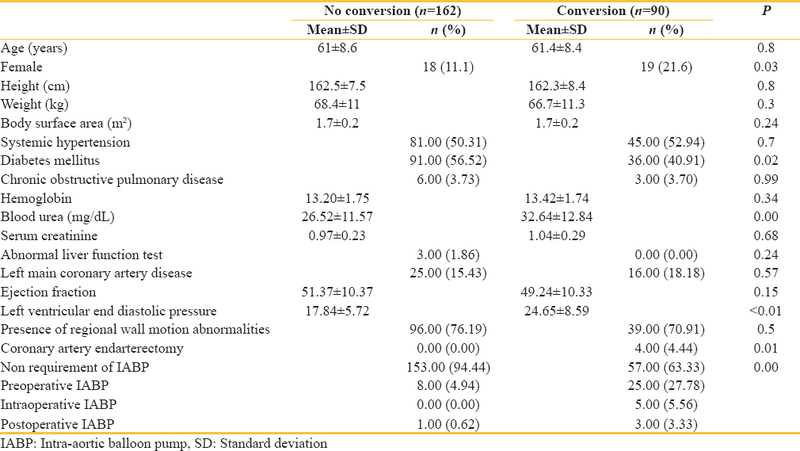 [Table 2] compares the characteristics of patients who underwent conversion and their controls. The mortality in the conversion group was 5.56% in contrast to 0.6% among the controls (P = 0.01). The conversion group had higher percentage of females, and lesser percentage of diabetics. They also had higher baseline blood urea, left ventricular end diastolic pressure (LVEDP), higher incidence of coronary endarterectomy, and increased intraoperative IABP requirement. They did not differ in aspects such as age, height, weight, body surface area, presence of left main coronary artery disease, and baseline ejection fraction. The total chest drain, duration of ventilation, Intensive Care Unit stay, and hospital stay were also higher in the conversion group. Patients who required conversion had 9.5 times higher probability of mortality compared to those undergoing uncomplicated OPCAB [Table 3]. 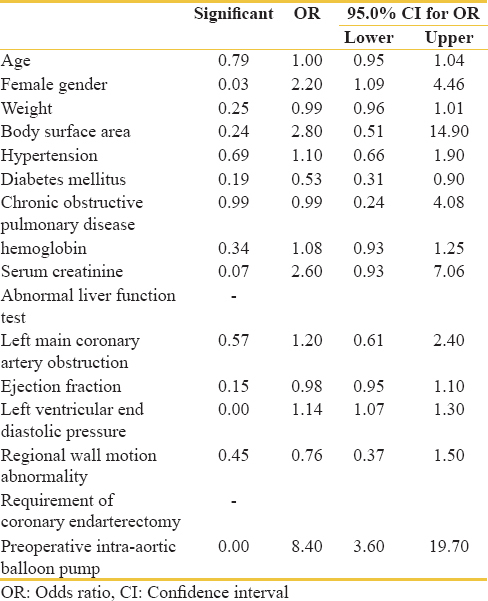 Factors associated with higher risk of conversion (from a univariate regression model) were female gender, LVEDP, and use of intraoperative IABP [Table 4]. In a multivariate analysis of variables using backward stepwise method, baseline creatinine level, LVEDP, and intraoperative use of IABP were found to be independent predictors for conversion [Table 5]. Conversion was associated with an OR of 3.2 for subsequent use of intraoperative use of IABP [Table 6]. Outcome differences between the two groups were interesting to note [Table 7]. An analysis of factors associated with conversion is important in manifold ways. It could help us identify patients at a higher risk of conversion. It is known that the outcomes of elective institution of CPB are superior to conversion. Modifiable factors could be optimized to improve the outcome. Unlike this study, a larger control group may help us derive a scoring system specific to risk of conversion, thus risk stratifying patients at risk. Such a risk score could be possibly used in modifying treatment options or formulating therapeutic algorithms. In this study, all patients who underwent OPCAB could not be included for analysis. Chowdhury et al. demonstrated the influence of experience of the surgeon as a most significant multivariate risk factor for conversion. In our cohort, all surgeries were performed by the same surgeon, and thus, the possible effect of variation of results between different surgeons was nullified. We found female gender, higher LVEDP, and intraoperative requirement of IABP to be significant predictors of conversion. These factors as risks for mortality have not been hitherto identified.About 50% of the females constituted the conversion group. Female gender is therefore associated with a higher risk of mortality after cardiac surgeries. A similar trend was observed in our cohort too. Females have lesser operative mortality after off-pump compared to on-pump techniques. Thus, avoidance of CPB was found to improve the outcome in them. The association between female gender and mortality in our cohort might be due to 2-fold impact of higher operative risk of cardiac surgery and higher risk of CPB. This is usually attributed to the associated risk factors such as advanced age and higher comorbidities; our cohort displayed no significant differences in any of the assessed factors. The role of LVEDP in prognostication of CABG patients has been studied. Salem et al. reported that the LVEDP (>19 mmHg) is an independent predictor for mortality after cardiac surgery even after adjusting for the LVEF. We describe the role of LVEDP in predicting the need for conversion, thus underlining the impact of diastolic dysfunction on the same. After noting its impact on mortality and morbidity in our study, we opine that it may be desirable to record this data during coronary angiogram. In absence of this data, pulmonary capillary wedge pressure might serve as its surrogate. The role of requirement of intraoperative IABP has been studied in OPCAB as a bailout device, especially in patients with severe left ventricular dysfunction. It reduces the 30-day mortality and improves the outcomes. Although many meta-analyses have reported beneficial effect of IABP in CABG patients, most of those patients underwent conventional CABG under CPB.,,, In our study, intraoperative IABP requirement was identified as an independent risk for conversion. This association may not imply causality but the importance of anticipating the conversion in such high-risk patient. It is logical to expect this because any patient requiring IABP would be seriously ill. On the other hand, intraoperative requirement of IABP is more in converted patients. The indications for requirement of IABP after bypass in our cohort were as mentioned above. The association between intraoperative IABP, intraoperative conversion, post-CPB IABP is interesting and they point at left ventricular dysfunction in general. The indications and contraindications of intraoperative IABP, conversion, and post-CPB IABP have to be well defined to better delineate the relationship between these. The method of selection and the number of controls is the major limitation of the study. They were chosen that way because we had to manually extract the data from case records. Collecting data from all the cases would have been optimal and provided more statistical power but would have posed practical issues with its execution. Most high-risk patients may not have got included in the converted cohort either because of the small size of coronary arteries or difficult surgery, which were our indication for elective CPB. Considering these reasons, the observations of this study may still be an underestimate. Conversion during OPCAB is associated with significantly increased mortality; the major risk factors contributing to it are female gender, increased LVEDP, and intraoperative requirement of IABP. Raja SG, Berg GA. Impact of off-pump coronary artery bypass surgery on systemic inflammation: Current best available evidence. J Card Surg 2007;22:445-55. Raja SG, Dreyfus GD. Impact of off-pump coronary artery bypass surgery on postoperative bleeding: Current best available evidence. J Card Surg 2006;21:35-41. Sun JH, Wu XY, Wang WJ, Jin LL. Cognitive dysfunction after off-pump versus on-pump coronary artery bypass surgery: A meta-analysis. J Int Med Res 2012;40:852-8. Lamy A, Devereaux PJ, Prabhakaran D, Taggart DP, Hu S, Paolasso E, et al. Off-pump or on-pump coronary-artery bypass grafting at 30 days. N Engl J Med 2012;366:1489-97. Raja SG, Dreyfus GD. Impact of off-pump coronary artery bypass surgery on post-operative pulmonary dysfunction: Current best available evidence. Ann Card Anaesth 2006;9:17-24. Shroyer AL, Hattler B, Wagner TH, Collins JF, Baltz JH, Quin JA, et al. Five-year outcomes after on-pump and off-pump coronary-artery bypass. N Engl J Med 2017;377:623-32. Møller CH, Perko MJ, Lund JT, Andersen LW, Kelbæk H, Madsen JK, et al. Three-year follow-up in a subset of high-risk patients randomly assigned to off-pump versus on-pump coronary artery bypass surgery: The best bypass surgery trial. Heart 2011;97:907-13. Vieira de Melo RM, Hueb W, Rezende PC, Alves da Costa LM, Oikawa FT, Lima EG, et al. Comparison between off-pump and on-pump coronary artery bypass grafting in patients with severe lesions at the circumflex artery territory: 5-year follow-up of the MASS III trial. Eur J Cardiothorac Surg 2015;47:455-8. Hattler B, Messenger JC, Shroyer AL, Collins JF, Haugen SJ, Garcia JA, et al. Off-pump coronary artery bypass surgery is associated with worse arterial and saphenous vein graft patency and less effective revascularization: Results from the veterans affairs randomized on/Off bypass (ROOBY) trial. Circulation 2012;125:2827-35. Shroyer AL, Hattler B, Wagner TH, Baltz JH, Collins JF, Carr BM, et al. Comparing off-pump and on-pump clinical outcomes and costs for diabetic cardiac surgery patients. Ann Thorac Surg 2014;98:38-44. Chaudhry UA, Rao C, Harling L, Athanasiou T. Does off-pump coronary artery bypass graft surgery have a beneficial effect on long-term mortality and morbidity compared with on-pump coronary artery bypass graft surgery? Interact Cardiovasc Thorac Surg 2014;19:149-59. Keeling B, Thourani V, Aliawadi G, Kim S, Cyr D, Badhwar V, et al. Conversion from off-pump coronary artery bypass grafting to on-pump coronary artery bypass grafting. Ann Thorac Surg 2017;104:1267-74. Borde DP, Asegaonkar B, Apsingekar P, Khade S, Futane S, Khodve B, et al. Intraoperative conversion to on-pump coronary artery bypass grafting is independently associated with higher mortality in patients undergoing off-pump coronary artery bypass grafting: A propensity-matched analysis. Ann Card Anaesth 2016;19:475-80. Pullan M, Oo A, Poullis M. Off-pump conversion: In-hospital mortality and long-term survival. Thorac Cardiovasc Surg 2017;65:296-301. Chowdhury R, White D, Kilgo P, Puskas JD, Thourani VH, Chen EP, et al. Risk factors for conversion to cardiopulmonary bypass during off-pump coronary artery bypass surgery. Ann Thorac Surg 2012;93:1936-41. Urso S, Sadaba JR, Pettinari M. Impact of off-pump to on-pump conversion rate on post-operative results in patients undergoing off-pump coronary artery bypass. Interact Cardiovasc Thorac Surg 2012;14:188-93. Mukherjee D, Ahmed K, Baig K, Patel VM, Darzi A, Athanasiou T, et al. Conversion and safety in off-pump coronary artery bypass: A system failure that needs re-emphasis. Ann Thorac Surg 2011;91:630-9. Mukherjee D, Ashrafian H, Kourliouros A, Ahmed K, Darzi A, Athanasiou T, et al. Intra-operative conversion is a cause of masked mortality in off-pump coronary artery bypass: A meta-analysis. Eur J Cardiothorac Surg 2012;41:291-9. Arifi AA, Huen E, Franke JG, Najm H. Off-pump coronary revascularization: A potential benefit for female patients? J Saudi Heart Assoc 2009;21:199-207. Salem R, Denault AY, Couture P, Bélisle S, Fortier A, Guertin MC, et al. Left ventricular end-diastolic pressure is a predictor of mortality in cardiac surgery independently of left ventricular ejection fraction. Br J Anaesth 2006;97:292-7. Yang F, Wang J, Hou D, Xing J, Liu F, Xing ZC, et al. Preoperative intra-aortic balloon pump improves the clinical outcomes of off-pump coronary artery bypass grafting in left ventricular dysfunction patients. Sci Rep 2016;6:27645. Theologou T, Bashir M, Rengarajan A, Khan O, Spyt T, Richens D, et al. Preoperative intra aortic balloon pumps in patients undergoing coronary artery bypass grafting. Cochrane Database Syst Rev 2011;1:CD004472. Pilarczyk K, Boening A, Jakob H, Langebartels G, Markewitz A, Haake N, et al. Preoperative intra-aortic counterpulsation in high-risk patients undergoing cardiac surgery: A meta-analysis of randomized controlled trials. Eur J Cardiothorac Surg 2016;49:5-17. Sá MP, Ferraz PE, Escobar RR, Martins WN, Nunes EO, Vasconcelos FP, et al. 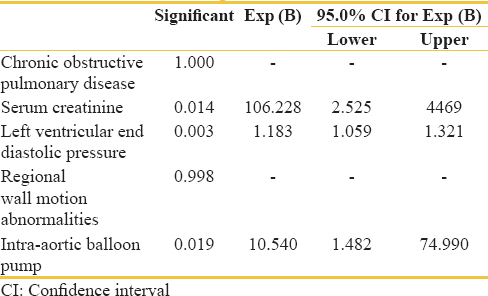 Prophylactic intra-aortic balloon pump in high-risk patients undergoing coronary artery bypass surgery: A meta-analysis of randomized controlled trials. Coron Artery Dis 2012;23:480-6.